When I was a kid growing up in Naples, FL, we went to the beach a lot. Sometimes we would go to the pier or the jetty to net shiners and dig up sand moles to fish for snook, flounder, and sheepshead. Sometimes my mom, my sister, my baby brother and I would walk the couple miles down to the beach and spend the day swimming and snorkelling. It was always a constant in my life, and something I took for granted. Now my husband and my kids and I live inland. For the seven years that we lived in Evanston, IL, “the beach” was the shore of Lake Michigan. As far as I was concerned, it didn’t count: I stubbornly referred to the so-called “sea gulls” as “lake gulls.” A beach wasn’t a beach if it wasn’t white and alongside the ocean. Of course, I was sort of stretching that definition myself, since Naples is on the Gulf of Mexico, but it didn’t matter. It was big, it was salt water, it qualified. My parents still live in Naples, so every time we visit them (like this week) we go to the beach. 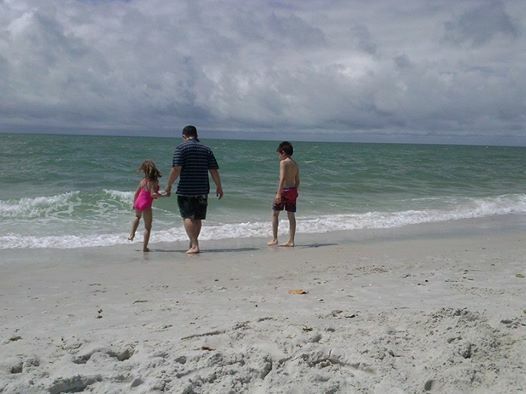 Watching my kids’ excitement as they run in the surf or build sand castles breathes life into my own memories, reminds me anew of how lucky I was to have the beach so close, even though I took it for granted.